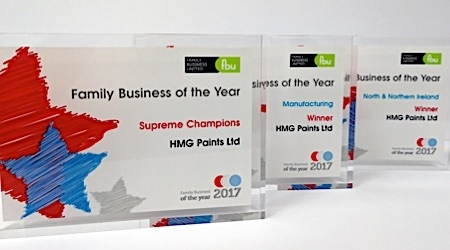 HMG Paints, the UK’s largest independent paint manufacturer, has taken the top prize at the prestigious Family Business of the Year Awards 2017. The awards were organized by Family Business United and were presented at a Gala Reception that took place in London at the prestigious May Fair Hotel, where HMG picked up three awards during the night. Since its incorporation in 1930, HMG Paints has been a family business. Generations of families have worked through the business and grown up together passing on their knowledge, expertise and passion to future generations. Whilst of course excellent paints and surface coatings are the lifeblood of their success, this is a business that firmly believes that building a business based on trust, decency and exceptional service forms long term partnerships and friendships that last. “HMG Paints represent a truly great British family firm and truly deserve all the plaudits that winning this award brings. Not only did they win the overall title, but were crowned Manufacturing Family Business of the Year the regional Family Business of the Year for the North & Northern Ireland too." John Falder, Managing Director of HMG Paints is delighted with the awards, added, "We are delighted to have received three awards at the 2017 Family Business of the Year awards. It was an absolute honour to be recognised amongst so many inspirational family businesses. “As we've grown we have never forgotten our roots and the emphasis on working alongside our customers to create the very best individual service and tailored solutions for them. Whether our paint is used on a car or coach, an aircraft or a boat, a kitchen door or a doll's house, to us it is above all 'our paint' and we are exceptionally proud of it. "With that pride, comes a responsibility and a genuine care of the products we make. 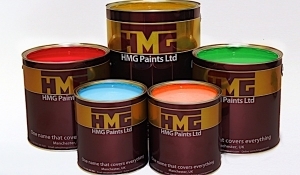 HMG have a broad spectrum of knowledge and expertise with a portfolio including wet paint, powder coatings and aerosols covering virtually every type of surface imaginable. “I am blessed by the outstanding team of colleagues I work with. This award is testament to the greatest team of paint makers on the planet! “This is a remarkable family firm and a deserved winner of the title. They stood out in many regards and as a family business are great ambassadors for the sector." Previous winners of the award include Bagnalls, Potter Logistics and WTA Group so HMG Paints are following in the footsteps of some incredible family firms. The Family Business of the Year Awards are organized by FBU, the award-winning magazine and resource centre that champions and celebrates the family business sector. Now in its fifth year, these awards recognise the diversity, strength and depth of family firms across the UK and seek to highlight the contribution that family firms make to the UK economy.